As every good squirrel will tell you, if you want to minimize your exposure to risk, never store all your nuts in the same place. The same thinking is applied by military strategists and paranoid rulers alike. It should be no surprise then, when traditionally centralized systems fail dramatically as a result of unforeseen events. Almost nowhere has this been made more starkly obvious than in Puerto Rico, where the devastation of Hurricane Maria left the island’s power infrastructure in tatters. Even weeks after the hurricane hit, 80% of the island’s transmission and distribution lines were down according to the Puerto Rico Electric Power Authority (PREPA), and only 9% of affected customers reconnected. This in turn had a massive impact on the island’s 3.4 million people, and at the time of writing this, stood to get worse as hospitals burnt through their reserve diesel supplies, essential equipment shut down, and medicines started to expire. Puerto Rico stands at a very interesting juncture. Does it rebuild its power infrastructure according to traditional, centralized models, where in this case most of the power was generated in the south of the island and most of the demand came from the north, or does it embrace a wholly new model? We should remember that even before the storm, the power industry in Puerto Rico was already creaking. PREPA, the only provider, had filed for bankruptcy in July and was already $9 billion in debt. It described its own infrastructure as ‘degraded and unsafe’. As of 2016, the sun-drenched island only incorporated 2% renewables into its energy mix, with 17% coming from coal and the rest from imported hydrocarbons (34% from natural gas and a whopping 47% from petroleum). This is meant that energy costs on the island remained high, averaging 25–30 US cents per KWh. This in turn has been blamed for the relatively high and steady unemployment rates of over 13%. Perhaps one ray of light to emerge from the shadow of this tragedy is a wholly reimagined, largely renewable, decentralized energy infrastructure. One which, thanks to a distributed arrangement of energy generation and storage nodes, is much more resilient to the devastating power of hurricanes. This is not a novel idea. Within days of the storm, the German energy storage company Sonnen announced plans to rapidly implement a series of microgrids on the island, starting off with emergency shelters and clinics. Elon Musk, never one to be shy of a challenge, was also quick to step up, declaring that Tesla’s technologies could be used to rebuild the shattered electricity system, engaging with the island’s governor and sending experienced staff to bolster the installation teams already on the ground. Let us imagine for a moment what this could look like on the ground. First off would be an announcement from the island’s Governor, that pre-registered private companies could legally start selling power at a cost-reflective tariff. To get the ball rolling, they would announce that some of the money that would have been used to begin the expensive process of rebuilding the large diesel power plants would go to a subsidy scheme that would subsidise each verified kWh delivered by a private operator. These private companies use these guaranteed subsidies to garner the necessary capital to begin to rapidly deploy microgrids around the island’s hardest hit and most densely populated areas. Soon, shipping containers start arriving in unused lots in town. Solar panels are unpacked and connected into arrays, small crowds of children gather. These containers are turned into neighborhood-scale solar power stations with battery storage most probably backed up with a diesel generator. The ‘micro-utility’ company would connect everyone in the neighborhood to this stand-alone power station, with a microgrid-specific smart meter in their home or business. A family living in a poor neighborhood that has suffered from a complete lack of power for months now, could now top-up their new account via mobile money or a scratch card and finally be able to switch their lights on at night again. The micro power station, located a few streets away, might also employ a few people from the neighborhood to keep the solar panels clean and generally look after the system. More and more the system becomes viewed as a community asset. Before too long, the neighboring solar-only microgrid is connected to this one and thanks to some basic built-in intelligence, an agreed standard and automated blockchain transactions is able to sell some of its excess day-time solar energy production to this microgrid when necessary. A year later, a large waste biomass-based power generation facility is given the green light and planners use the shared data available from all the private operators to site the new generation plant close to where demand has been shown to be greatest. They use the same data to schedule the unit to operate at peak capacity at times when the island’s microgrids are relying on less-efficient battery storage. Slowly the nodes of generation, storage and distribution grow together into a resilient, efficient mesh network. A modest statue of the Governor is erected in the main plaza in San Juan. Those that look closely notice a small bronze squirrel nuzzling up to his ankles. Microgrids can generally be defined as self-contained units of generation (often solar), storage and distribution. They are an obvious choice in this context, not least of all because they can be so rapidly deployed. A recent Power4All report points out that microgrids can meet basic energy needs in half the time and at a tenth of the cost of traditional approaches to power provision. The costs of the technology, both generation and storage, also continue to fall with cost parity versus fossil fuel alternatives being long since achieved in most contexts. It should be remembered that this is not a black or white choice. Microgrids do not need to stay forever ‘islanded’ or isolated. Most can be integrated into a national, centralized grid if necessary, or even better, a number of microgrids can be connected together forming a very resilient mesh network of independent nodes; a military strategist’s dream. It would seem then that rebuilding Puerto Rico’s energy infrastructure with microgrids is a proverbial no-brainer. It will be interesting to see what really happens. People living in large swathes of the developing world are dogged by the problems of poor access to electricity. This affects access to basic services such as vaccines and medical facilities in similar ways as in disaster-hit areas. In a lot of these cases, particularly in sub-Saharan Africa, this energy poverty is exacerbated by obstructive national policy and a lack of progressive regulation. In East Africa, a group of private microgrid developers have joined forces in one of the sector’s first ever industry associations to challenge this kind of short-sighted national policy. One of AMDA’s (African Minigrid Developers Association) key aims is to get the Kenyan government to extend the same subsidies that it traditionally pays to the operators of the centralized grid to those building or buying power from decentralized microgrids. Again, this would seem like a no-brainer, in this case a triple win, with the nascent ‘micro-utility’ industry benefiting from reduced costs and the implicit increase in investment and thereby being able to deploy more microgrids. As a result of this, the government makes more progress towards hitting its ambitious electrification targets and most importantly people in rural, underdeveloped areas are provided with much needed access to an affordable, and reliable source of clean energy; a ‘pre-requisite for development’ as the UN Secretary General pointed out at the launch of the UN’s SE4All (Sustainable Energy for All) initiative. 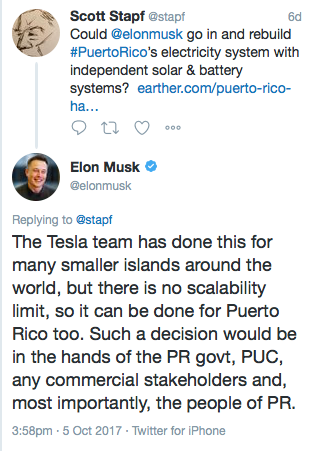 We applaud bold steps like those taken by Sonnen and Elon Musk (disregarding the cynical cries of positive PR spin doctoring) and progressive decision makers like Puerto Rico’s Governor Ricardo Rosello. It is abundantly clear that the business-as-usual approach to global power provision has got to change. Wouldn’t be ironic if it was ‘under-developed’ locations such as Puerto Rico and Kenya that demonstrated to the world what a future of efficient, decentralized renewable energy systems could look like?